When it comes to Epcot rides and attractions, the best thing you can do is to know which ones are there, and which ones are the must-experience Epcot rides. First things first, let’s get to all the rides that Epcot has to offer. Compared to the other parks it can feel like Epcot might have a few less rides. But that doesn’t mean that you can’t spend multiple days here on your holiday and see different things every single time. 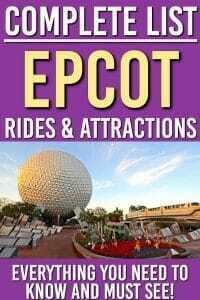 Let’s get you oriented with all the rides and attractions Epcot has to offer. What you need to know is that the park is broken up into sections. To make things easier we will go section by section. Need more Disney World planning tips? This is the first thing you will see when you walk in. It’s the big Epcot dome and the surrounding area. Here are the rides to in Future World. Ahh the big dome that is synonomous with Epcot. If you are wondering what’s inside, it’s this ride. It’s a seated slow ride that journeys through back in time to show you how things have evolved for us humans over the centuries. You travel through out the dome (which is 18 stories tall!) and it’s quite the experience. Don’t worry it’s not a fear of heights ride. My kids loved this ride and it’s not to be missed. We managed to get on easily by using our later Fastpasses. While this won’t blow your socks off like other rides in Epcot, it is a nice break from the heat, and pretty eye opening. Plus it’s in the giant dome making it a must for first timers. This is a walk through style exhibit and offers hands on things to play with from the near future. You can try out new technologies and and view the “how things work” displays. This one can take some time so check it out when you are getting near the end of your day. This is more suited for younger children. Our kids played there a little bit, but there were younger kids (under 7) that were really taken by the interactive displays. This is a must for all first time Epcot go-ers. Coca-Cola has sponsored the exhibit and offers tastings of different Coke products from around the world (have your camera ready when your kids try Beverly from Italy). It’s a great place to get out of the sun and grab some free refreshments. That’s right all the Coke samples are free in the exhibit. If you want a map Epcot you should check out Disney Wolrd’s map here. This is a treat for everyone to get and try some diferent drinks from around the world. It only takes a few minutes and is a great place to get a drink while going across the different pavilions. If you are looking to meet and greet with some characters and escape the heat at the same time, this is a great place. My son and I went and met Baymax from Big Hero 6, while my wife and daughter went across the way to see Joy and Sadness from Inside Out. There are different characters through out the day so check to see what is there when you arrive. Long wait until Disney World? Build excitement with these Disney World Count down ideas! Chevrolet sponsored this ride and you are very much made aware of it. But that doesn’t take away from it being one of the best rides in Epcot. I’m not a car guy but it’s pretty cool ride and getting to test out your car at the end to see how it compares is pretty cool. This car ride can get you up to 60 mph and it’s a thrill! Try for this one earlier in the day, as the lines get long. We did this a few times and loved it! You go around 65 mph and it’s enjoyable for the whole family, though car enthusiasts may enjoy it more than others. I’ll be honest the kids loved it, but it made me a little nauseous. There are two levels to this ride. This ride simulates going into outer space in a space shuttle. There is a spinning version and a non-spinning version of this ride. It is incredibly realistic and fun. Note: You are in a closed in space ship, so if tighter spaces bother you it might not be for you. This is the non-spinning ride, it typically has shorter lines and you can get through it faster. Think of it like green means anyone is good to go (except if you are young, pregnant or have another condition that would preclude you being shook around like this ride does). This is the spinning ride. It’s quite a bit more intense and usually for more thrill ride seekers. If you don’t like spinning, opt for the green one. This ride is more intense than other rides in Epcot. In fact, it’s likely the most intense ride there (even the Green ride can make you queasy). Our family enjoyed it but coupled with the heat and time of day we tried this, I was eager to get off. But that’s just my weak stomach talking. If you love thrill rides, then this is a must. This is another great cartoon show that was way better than I expected it to be. If you like short films and an immersive 4D experience then this is for you. It’s also an easy one to get into and can be a nice break from the outside should you or the kids need it. I had low expectations of this and almost skipped it. I’m happy we did it, the films surprise you (I won’t say how) and I could have easily watched them a second time. Plus it’s nice to escape from the Florida heat in the summer time. This attraction is a little dated, so I would hold off until you need an extra ride in your day. This takes you on the scientist journey with the crazy character Figment who destroys the lab with much humor. It was nice to have done once, but I wouldn’t prioritize it over others. The kids enjoyed this ride more than the adults. It’s a little dated but still a fun car ride that moves gently through the imagination lab. If you are short on time you can give this a miss. This ride is amazing! You must book this ride. It’s a flight around the world over some of the coolest places. Honestly I could have done this ride a dozen times in a row and not been bored. It’s got a bit of heights in it, but you are simulating a hang glider around the world. It’s incredible! DO. NOT. MISS. THIS. RIDE. This is the second best ride in all of the parks (the first is Animal Kingdoms ride, Avatar: Flight of Passage)! You soar around the world and it’s one of the more memorable moments I have in Epcot and all of Disney World. Very cool! Anything with the Lion King is amazing. This environmental fable is in an area that is nicely air-conditioned and has some restaurants to eat in the area. It’s not so much of a fun video but it does have an important message. 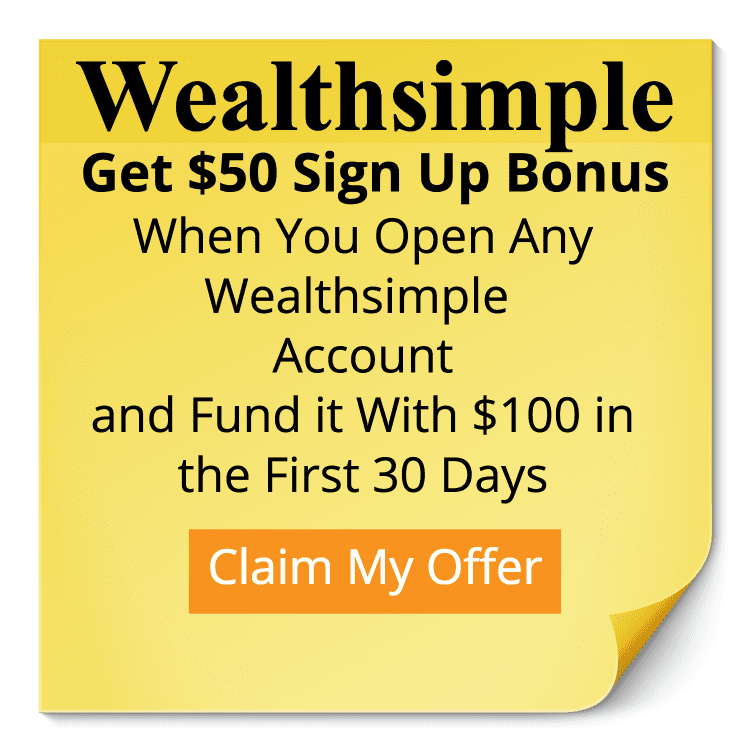 This is a great wake up call video for everyone. Not a must see, but if you want to get out of the heat and find yourself in the pavilion with time to spare it’s a good video. This once was cooler than I thought it would be. This boat ride takes you behind the scenes to explore how some foods in Disney World are grown. There are some neat ways that Disney explores agriculture and it’s as entertaining as it is informative. We did it twice just to take it all in. I really enjoyed this boat ride, it shows you a lot of different food innovations that are going on in the park and the world as a whole. Our kids like it but didn’t need to do it a second time. Still adults may enjoy this behind the scenes of some of their foods that are served in the park. There are a few shows in this area. You can see sea life and interact with different amusements. There are plenty interactive exhibits to keep you out of the sun for a while. This is a nice show for kids and a welcome break for parents. Crush from Finding Nemo appears on screen and interacts with the kids in the audience. He learns some names and jokes around with them. It’s an amazing interaction with animation and real-time animatronics. It’s pretty cool when you think about everything that goes in to it. This huge area is where you can view fish and sea mammals in their habitat. There is another section that houses dolphins and sea turtles as well. After you view the giant tank there are other places that you can see different smaller fish (like Nero’s clown fish) as well as things like jellyfish. If your kids have never seen sea life before they will love this! This is a sitting ride featuring all the glory that is Finding Nemo. You enter the seas in a clam mobile and are met by Mr. Ray and his class who need your help to …. get this… find Nemo! All the characters you have come to know and love from this movie are here and it’s one of the highlights of the pavilion. Throughout this pavilion there are places for you to explore other countries and see what there is to offer. It doesn’t open until a little later in the day so you don’t have to rush to see it. Honestly I thought I was done with Frozen (our iTunes play count for Let it go sits near 1000 plays) but the one thing Disney does with it’s new rides is hit them out of the park. I got off Frozen and could have gone right back onto it, had it not been for the 70 minute wait. This one is worth the FastPass. One other note is that Frozen did shut down a few times when we were there. So it’s probably worth booking this as early as possible. But that’s all a part of our Disney FastPass secrets and strategy. This ride was better than expected, in fact it gave me goosebumps at one part. If you aren’t big on Frozen you could skip it, but if you have the time and your kids love Frozen then you will want to make this one a must see! After Frozen Ever After, you can go next door and meet and greet with Elsa and Anna. It was really awe inspiring to watch our kids meet them and have their faces light up as they have watched Frozen more times than I’d like to admit. This is a film about China and Chinese culture. Depending on your family’s interest it might be a nice way to take a break. It’s a standing video so be mindful of any tired legs. This is an animatronic show that features the history of America. It’s fairly long (nearly half an hour) so you may want to pick a time that works for you. Another video (around 20 minutes) this time of France and it’s people and culture. It’s a nice way to experience a little bit of French culture, without boarding an Atlantic flight. This panoramic screen depicts Canada’s diversity of people and diverse landscape. It’s a 15-minute film about all the great things in Canada. This is the fireworks show at the end of the night. It’s an amazing display of fireworks (really all of the parks are nothing short of amazing) if you aren’t too tired it’s worth sticking around for. People start to get good positions for the show hours before. You will need to balance a great view with being able to see more rides. Hint: We stayed back and once the show was over rushed back into Future World and jumped on a few rides pretty quickly. Since this is long, here are all the other rides in Epcot. The Epcot FastPass system is a little bit different in Epcot. In that you are going to have to make some tough choices initially and plan things out a bit. Epcot has two Fast Pass tiers, there is Tier A which you can book 1 pass with before your day at the park. The other is Tier B, this one you can book two rides. The problem is that 3 of the best rides are in here and you can only pre-book one of them. To get around this you should book the one that you believe is a must see (if you have younger children it might be Frozen Ever After) personally I would book Soarin’. It’s one of the coolest experiences in all the parks. The only thing that beats Soarin’ is Animal Kingdom’s Flight of Passage (which you can read about here). Because you can book two of these, I would book them early, and pick Mission Space and Living with the Land. But I’m getting ahead of myself. 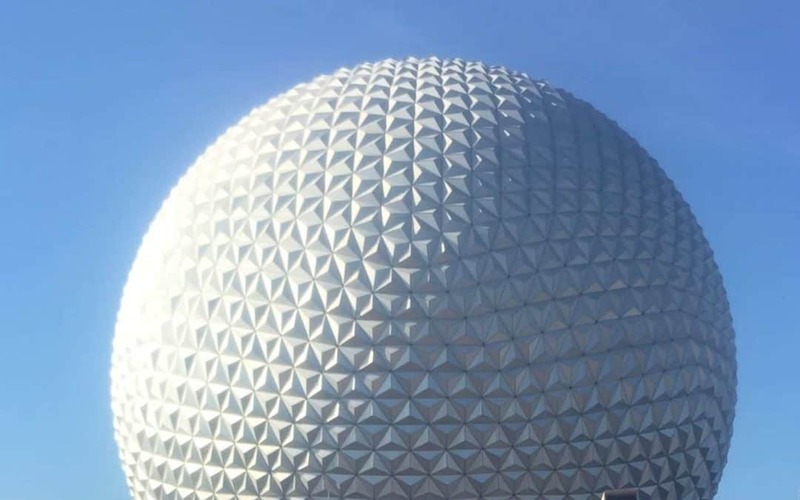 If you are looking for a way to do Epcot in a day you can check out our 1 day Epcot plan. 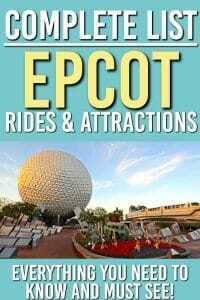 It breaks down how we went through our first day at Epcot and managed to see most of the big rides in one day. Help other with their Disney World trip to Epcot by sharing this post!